Which planet has more oxygen, Earth or Venus? I really don't know. Earth is larger, and more dense I believe. It would seem more likely to me that it would be Earth, by a larger mass. But the actual mixtures from top to bottom, how might I know? I like people who criticize angels dancing on a pinhead. I also like it when angels dance on my pinhead. This is on topic for being a history of underground lakes which once existed on Mars apparently. In the words of the Geology Department researchers, "Our research suggests that, given that the process was regional rather than global, there could still be large reservoirs of subterranean water trapped under the surface of Mars, in the areas around the old northern ocean, or in other parts of the planet where seas and lakes formed at the same time." "Traces of ancient environments capable of sustaining life forms similar to those on Earth could have been preserved in sub-surface materials that are now exposed," say the researchers. "The results obtained could have clear implications both for exobiological research and for future human activity on Mars." That would have to be some very deep hidden canyons. Not exactly the same as lake Vostok, and not likely either I think to still have liquid, but maybe. Who knows. If the Northern half of the planet is a sediment filled ocean basin, and the sediments are mud and ice mostly, perhaps if it really were an ocean floor, there might be hidden "Undersea" vents in a deep hidden canyon. Vostok being glacial, and any canyon lake not quite the same, but perhaps there would be similarities. One think would be very true, is that if you could find a remnant of such a lake, either with liquid water or totally frozen to the bottom, it is worth investigating if it can provide for needs for humans on Mars. (And of course scientific data). You could build very large buildings in it, where you dig down, (And get more water), to build a new floor below. You could also expand out sideways for more space. In some ways nature says that a large body is suited to a cold environment. If radar determined that their was liquid water, then perhaps for science that would be drilled down to. However to suit the building I suppose you would want a layer of ice ideal for your building. That is where eventually you reached bedrock. If you could also reach a suspected ore body by doing that so much the better, but detecting it might be a problem, except for perhaps Iron. Anyway, someday sometime. One big giant building/city. Makeup water provided by expanding into more volume of ice. I am encouraged to update this topic because of four items of support that have been accumulated from the web by myself, other peoples accomplishments, which even so support and encourage the notions of creating lakes, and using them for purposes for human habitation of Mars. 1) Could Liquid Lakes Form on Mars Today? Despite its frigid temperatures, Mars might be able to host lakes of water on its surface today, a new study suggests. Although extremely small amounts of water would quickly evaporate in Mars' low-pressure atmosphere, water from sources such as aquifers could last long enough to pool, with larger pools remaining liquid for at least a year, researchers said. He created a simulation to determine if liquid water could puddle and form pools to remain liquid today. "You could get it for a little while, potentially," said Goldspiel, who presented his results Nov. 12 at the 47th annual meeting of the American Astronomical Society's Division for Planetary Sciences in National Harbor, Maryland. Billions of years ago, Mars had a thick atmosphere and a relatively warm surface with lots of liquid water. But the Red Planet lost most of its air to space billions of years ago and, as a result, is very cold and dry today. For example, surface temperatures on present-day Mars can dip below minus 80 degrees Fahrenheit (minus 60 degrees Celsius). And the planet has low surface pressures, so small amounts of liquid water quickly turn to gas. "If you put water on the surface, either it evaporates or [it] freezes," Goldspiel said. Recent research suggested that if a significant amount of water flowed from a source such as an aquifer, it could stay liquid on the surface for a while, forming the puzzling features known as recurring slope lineae (RSL) that appear on some Red Planet slopes during warm months. RSL could form if a landslide or some other event exposed a source of water at the surface. Eventually, the water would begin to freeze and replug the source, cutting off the flow, researchers have said. Goldspiel wondered what might happen if the water managed to collect in a pool. He simulated the flow of both hot and cold water running down a slope to collect in a basin with a 320-foot (100 meters) radius. While the surface layer would evaporate off, a layer of ice would eventually cover such a pool. For shallow ponds just 10 feet (3 m) or so deep, Goldspiel found that the water would freezealmost immediately. However, when the water flowed long enough to form lakes about 65 feet (20 m) deep, it would remain liquid for at least a year, he found. Furthermore, cold water — at temperatures around 35 F (2 C) or so — would form an icy crust that would act as a thermal blanket, Goldspiel determined. In the Martian summer, any ice throttling the source could melt, allowing more water to flow down to the pool. The new water would freeze on top of the existing ice, but would provide some warmth that could pass through and melt the layer in contact with liquid water, helping to thin the ice layer even while building it. However, if the water were hot — around 170 F (77 C) — it could not only build the small lake but also help keep the layer of water beneath the surface liquid. Beds of ice have already been found beneath the Martian surface, and other scientists have proposed that liquid water could lie under the planet's red dirt. Pockets of subsurface water might even be able to support life, protected against the harmful radiation that scours the planet, many astrobiologists say. A one-time spurt from a hot-water source would eventually freeze over. So far, Goldspiel has run his simulation for only one Mars year, but he plans to run it longer to see how long such a pool would last before freezing over. He estimates it would take three to four years to freeze solid. However, if that water were continuously replenished, the pool could last even longer, with incoming hot water helping to melt the already-thinning summer ice. Hot water might come from features like a low-pressure hydrothermal vent— or, as Goldspiel called it, a "hydrothermal seep." "It's not an unreasonable temperature for a hydrothermal system," he said. So, if I understand what is said above, what limits the existence of lakes is the supply of flowing melt water on the surface. It is my intention to create artificial melt water in order to "Inflate" a lake, so, with the notion that lots of ground ice exists, the above article supports an easy route to the inflation of a lake. I had previously thought that it might be necessary to start a lake by filling a hole with broken ice, and the covering it and melting it. The above suggests that if you can create sufficient quantity, you can just flow the water into a hole. It does limit the life of the lake to a smaller degree to evaporation from the surface of the lake, but more seriously the life of the lake is most limited by the factors which would cause it to freeze into ground ice. Since solar energy could be used to keep the lake melted by the intervention of humans, freezing is not a major risk. For a long time I tried to figure out how to protect the surface of the ice of a lake on Mars. The ETFE plastic might be good. We could try ir filled domes as in this picture, or I prefer to consider "Balloons" of ETFE filled with water that is allowed to freeze into ice. These then would be ETFE coated ice blocks which could float on the surface of the lake. This would offer some protection. It would reduce evaporation, but evaporation could still occur from between the edges of the plastic coated ice blocks. For this issue you can have two further treatments, to seal it up like a cactus perhaps. Overlayment method: Put anther sheet of ETFE plastic over the ice blocks, and leave that air filled. As water evaporates from between the ice block cracks, it fills the air space, and can be sucked out and pressurized to yield distilled water. That water which would have been lost is then a resource. Once it has been used by humans, it can be put through some type of treatment for wastewater and returned to the lake. I have to think that you would want this option no matter what. Underlayment would be an option where you have a layer of ice under the ice blocks. You also could put a layer of plastic between the ice blocks and this lower layer of ice. You could even put some insulation under the lower layer of ice, but at best it would be translucent, and I want the light to shine into the lake. So, I am beginning to think then that it would be just fine to try to use plastic coated floating ice blocks mostly floating on liquid water. The plastic layer will allow the water below to be just a bit above 0 degC / 32 degF. Yes, as the ice block layer flexed the ice between the blocks would crack, and evaporation would happen, and even when the ice in the cracks between the ice blocks was stable it would still evaporate a bit, but so, what? If you can collect the evaporation and turn it into distilled water for use, so what? The Aquarius Reef Base is an underwater habitat located 5.4 miles (9 kilometers) off Key Largo in the Florida Keys National Marine Sanctuary. It is deployed on the ocean floor 62 feet (19 meters) below the surface and next to a deep coral reef named Conch Reef. Aquarius is the only undersea laboratory in the world dedicated to science and education. It was owned by the National Oceanic and Atmospheric Administration (NOAA) and operated by the University of North Carolina–Wilmington until 2013 when Florida International University assumed operational control. Florida International University (FIU) took ownership of Aquarius in October 2014. As part of the FIU Marine Education and Research Initiative, the Medina Aquarius Program is dedicated to the study and preservation of marine ecosystems worldwide and is enhancing the scope and impact of FIU on research, educational outreach, technology development, and professional training. 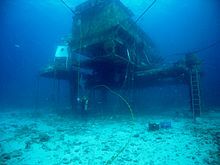 At the heart of the program is the Aquarius Reef Base. This one is likely to be hard to satisfy, but I am hoping. Perhaps if the Rift Valley and the Northern Basin are filled with "Sediments" of Ice, Wind blown sediments / Volcanic ash, we can hope to find a substantial fossil sandstone deposit buried beneath significant ice. The ice can be melted into a lake, and in the sandstone lake floor can be constructed caves filled with air. Sandstone/Underwater caves are another separate skill I think but I wanted to include the possibility that they could be connected lake habitat methods. 5) I queried for "Underwater Vegetables" and was really surprised to get ahold of this! 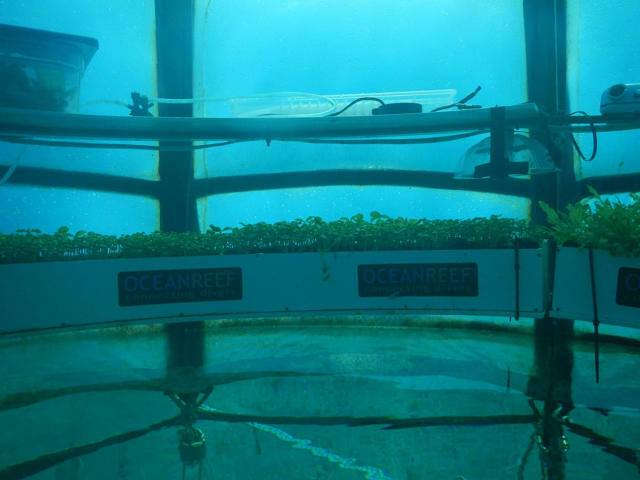 A greenhouse underwater sounds both implausible and impractical. But why not? The temperature doesn't fluctuate, so there's no frost. Aphids can't get anywhere near the plants, the pumped-in atmosphere is CO2-rich. And the plants — apparently—love it. The Orto di Nemo project—Nemo's Garden, as it's called in English—resides 30 feet under the waves, off the Noli Coast in in Italy. Head "gardener" Sergio Gabriel and team have tethered bubbles to the ocean floor and filled them with air. These open-based bubbles work like diving bells, and look like something straight out of a Jules Verne novel. A shelf runs around the inside of the dome, and on that shelf sit plant pots. Currently Gabriel, president of the Ocean Reef Group, is growing basil, strawberries and lettuce, just like you'd grow it on your kitchen window-ledge. So, I am rather happy with the previous sequence of discoveries. I want to talk about the UV, and dust. I hope that it will be possible to allow the UV to penetrate through the ETFE coated floating ice blocks and for there to be a layer of something that will absorb the UV, and release it's energy as either heat, or perhaps even behave like a "Fluorescent Light Bulb ". But of course I want the visible light to get through as well. In other words, I want it all. All the energy from the solar flux going into the lake. For that reason, it will be desired to have robot cleaners on the surface which remove dust from the ETFE plastic surfaces on the top of the Plastic/Ice Block layer, and it's overlayment layer. Should we still not get as much light into the greenhouses as we want, we can resort to heliostats in the water, focused on a greenhouse. And those reflectors perhaps could involve Fluorescent properties to convert longer wave light into spectrum that plants prefer. Finally, there will be many ways to generate or obtain chemical resources. CO, O2, Hydrocarbons. This lake could be enriched by a chemosynthesis process to produce organic product, along side of a Photosynthesis promoted process. So mushrooms can eat the organic matter that is typical, and they also can eat oil. I feel that some effort should be made to create a Franken Fungi, which would contain more nutrition than existing fungi do. Perhaps Protein. A substitute for animal protein. I think if it could be done, it would be a very efficient way to substitute to some degree for some meat. A mushroom does not waste energy heating it's body, or moving around. A cow does. They both consume Oxygen, but the Mushroom would consume less Oxygen for food produced. Even less than fish. And perhaps if we ever do contact an alien race a long time from now, I think possibly they would approve if we phased out eating things with faces. Perhaps. Although I might suggest that if it is pleasant to eat in any way, then the next generations raised on it would form their own happy associations with it whatever it is like, and it would then be their normal. I should probably take a bit of time to self criticize what I have recently included in this topic. "Potential Lethality" and "Relative Convenience" might be two phrases by which we might try to rate methods to manipulate matter on Mars to obtain a living. Out on the surface in a space suit appears to me to have a greater Potential Lethality, than being in say a 33 foot water column of water where the water temperature is 0 degC / 32 degF to 3.89 degC / 39 degF. I don't have test data, but it seems to me you have greater chances of rescuing a cold water diver or for them to self rescue, then your chances of rescuing a person with a lethal suit failure on the surface. Further a column of water provides additional radiation protection. For purposes of Relative Convenience, I think the contest will be less certain. If you develop good methods to inhabit cold water, and create a practical layout, I think the Relative Convenience will be better in the cold water than on the surface, for many activities, perhaps for agriculture in particular. I think it would be great to improve on the cold water method and provide warmer water subsections using materials. Also there is the notion of brine inversion solar ponds, but corrosion might be a significant problem there. I choose to honor all methods that appear to have chances of success, Aquatic, and not, I think that the end goal is to have a variety of methods that can eventually be integrated into a sensible way t make a living on Mars. That comes down to design and new forms of technology, remember that europa is a liquid planet and what we can develop on earth will add the development in space bodies with liquid surfaces. Also the development of outer shell pressures and inner shell pressures need to be examined and new technologies are required. To maintain ground pressure at 5000 feet below the ocean without effecting the crew within, that will help space vessel design for venus probes, help with jupiter and saturn missions and europa missions as well. We just don't look at the science and technological developments and also the new biological information we could examine and understand that would help humanity. I will argue that for the purpose of human use, a water column can be sliced like an onion, with layers which each have a different potential for human use. Go below 200 feet on the Earth, and ~600 feet on Mars, and standard diving methods will have to be replaced by more expensive and troublesome methods. So, I will consider this the normal lower limit for human activity in water. You would have to have a very large reason to compel you to try to work at higher pressures than that, so, from my point of view 5000 feet on Earth and 15000 feet on Mars are well out of any activity I would consider in any way rational. In the gardens of Italy, also, I will argue that we have something new. Although we have to be concerned about efficiency, and productivity, the early results are promising, and it is a thing in it's infancy. -Allow the passage of visible and UV light into an impoundment. To me this signifies the possibility to simulate or artificially create an analog to shallow high latitude fresh water lakes. And I anticipate that these bodies of water can be much more photo productive than such shallow high latitude fresh water lakes, because of the potential that they can be made to exist at lower latitudes, and also that snow will not cover them. We have seen that in Italy they are employing diving bell type transparent/translucent structures. This is likely to evolve into other things I think. For instance, we might ask if we could find a suitable height in the water column on Mars say for a minimum survivable pressurization, and to allow light transmission to plants. I think on Mars that might be about 25 feet of ice and water. For diving bell structures, this would require a atmosphere of almost pure O2. However, I am thinking that if you had a grid of tubes instead of diving bells, and that was laid out as a horizontal grid, then you could also have tubes that are pressurized. So your counter pressure would give you 250 mb, but your tensile pressure in the tube network might allow you to add a significant amount more. So, you might have a tube pressure of 10 lbs maybe, with an O2/N2 mix. These horizontal tubes would be transparent/translucent. But I would add opaque and insulated vertical (At a 45 degree angle actually) tubes, filled air. Those would be escape and access pathways. So if your lake floor was 64 feet down, in the event of a leak, it would be obvious where it was. Adheasive tape most likely would effect a temporary repair. But if the damage were more serious, then you could either jump into a vertical tube and drop an elivation of 42 feet which on Mars would be like dropping 14 feet, and hitting water. (I can think of ways of making that safer. Or you might slide down 45 degree tubes. The point is you would get to the lake bottom, where you could further seek protection from depressurization, and cold water. You should be able to avoid the bends. I think you get the picture. It is a method, and in this case the survival logic is significantly different than for that of the Earth. The temperature of the water should be realtively constant for the tube structure, and as previously stated, a leak from the tube structure should be obvious since it will be visible, and also audable. Means to repair can come from the inside, and also with a diver from the outside. I suppose that under certain circumstances, you could say the same for domes, or such structures in Martian atmpsphere, but what if your emergency happens in the dead of night when it is very cold outside? Not as easy I think. However, even though I have suggested this pressurized tube structure in a reservoir of water, I do not intend to be restricted to it. Indeed diving bells might be quite OK for some purposes. In my mind this however is not an OR situation. It will be perfectly sensible to try many different things, and to see how practical they are. Therefore sure other things. I do not intend to not think about biotowers with heliostats in the open air. You try lots of things, and you find out what works. I anticipate that a mixture of methods will be used. That's how things work on Earth. Now here is a pretty little thing. What does it have to do with the topic? Well, if you could add this to your transparent/tensile tubes, they should have a lot of tensile strength. The team, led by chemistry professor John Badding, applied alternating cycles of pressure to isolated, liquid-state benzene molecules and were amazed to find that rings of carbon atoms assembled into neat and orderly chains. While they were expecting the benzene molecules to react in a disorganized way, they instead created a neat thread 20,000 times smaller than a strand of human hair but perhaps the strongest material ever made. The Penn State University researchers immediately had a hunch that these diamond nanothreads, which are remarkably light and strong at the same time — could prove to be an ideal material for a space elevator, a long cable anchored on Earth and reaching into space to attach to a satellite in orbit. I recommend reading the whole article. Interesting. Anyway, I think if it were possible to create a 3D printer to print/weld plastic webs, and to incorporate these diamond nano-threads into it you might have something. I speculate you might want it to have a mouth like a paper wasp, and to be able to weave these threads in. I don't know what deterioration the nano-threads might face being embedded this way. Chemical instability? U.V. damage? So it has to be though out, but it's an interesting idea. Of course if you succeed in making it for a lake, it could also be used outside of a lake. Light intensity drops with depth and with that the max useable depth will be. Now depending on if we grow anything in the water its depth will be reduced for the bubble that contains life making it such that we will need to be nearer to the surface. We will be using the very water that we are in to give the underwater colony fresh water and for waste removal as well. Your challenges are appropriate, I will try to argue to sufficiently address them. Nowadays, Nemo’s garden includes more than 5 biospheres boasting underwater bubbles anchored to the sea floor and floating vertically at depth between 18 and 33 feet. I am working with approximate estimations. Doing this I am satisfied at this point if an assertion can be considered reasonably plausible. If the estimation errs outside practicality, there are some tools to calibrate the situation and bring it into practical limits. 1) Improved water clarity, allowing sunlight to penetrate better. Lin and his colleagues reportedly used recombinant DNA methods to connect the bacterial DNA to plant DNA sequences. The result allowed bacterial proteins to be produced in plant chloroplasts and successfully assemble into a functional Rubisco enzyme. The study details how this altered enzyme - which is involved in the first major steps of photosynthesis - works significantly faster to convert CO2 into glucose (energy), compared to a plant's traditional Rubisco enzyme. And faster energy conversion means greater production and yield. That's exactly what the researchers saw in their first crop of genetically enhanced tobacco plants - a proof-of-concept for further work on major crops like corn and wheat. We have two underwater greenhouse designs to consider so far. A) The diving bells they use, where an O2 low pressure atmosphere is required. B) A 3D grid of pressurized tubes, where the highest horizontal tubes are to be transparent/translucent. To bring as much light and heat into the lake as possible, it may be desired to discourage micro-organisms in the water itself, except for special isolated enclosures. This would help water clarity, and would reduce the amount of effort needed to be expended to clean transparent / translucent wet surfaces. By way of Henry's law, the amount of dissolved gasses in the water will be low. The water temperatures will be cold in the case of this type of lake. There should be no intentional effort to fertilize the waters, if the water layers are static, where you have 32 degF on top and 39 degF on the bottom and no turn over, this should reduce the amount of nutrients available. Further, if necessary a poison might be employed to discourage microbes, but I would rather avoid it. Without the poison option, it might be possible to strain out the free floating microbes (Algae), and therefore remove nutrients from the waters. Could be moved closer to the surface, but it would compromise other objectives. For "A" you would need a pressure suit to have a person gardener work in the diving bell. For "B", the counterpressure (Base Pressure) will fall below safety margins for emergencies where if a tube is ruptured a person might use an Oxygen mask to continue working, and might be fatal for depressurization. So, I want to try for 25 feet (Base Pressure). 3.675 psi O2 for diving bells, and 9.8 psi O2/N2 mix for the pressurized tubes. Along side of and slightly below the horizontal tubes might be placed concentrating reflectors, to improve the amount of lumens in the horizontal tubes. (This could be done for the diving bells as well). This is easy enough to understand. Perhaps they will be fixed, perhaps sun following. Then there is the "Franken Plant" improvement of photosynthesis, and also other modifications of plants to make them tolerate lower light conditions. *It is my understanding that many plants will do rather well with 1000 lumens, where our daylight might supply 10,000. So, I have reasonable hopes that this concept is technically feasible by utilizing necessary compensating mechanisms. Hopefully it would be sufficiently profitable and comfortable to justify the effort. I want to try for 25 feet (Base Pressure). 3.675 psi O2 for diving bells, and 9.8 psi O2/N2 mix for the pressurized tubes. In the worst case for depressurization of the tubes, Oxygen masks will deploy as in an airliner (Or trained people will simply retrieve them). Also they will have the option to exit the depressurizing tubes by moving down vertical tubes to the bottom of the lake. *Note: I have specified a preference for relatively sterile water for the main lake, but this does not exclude the option to have a transparent water filled bag in the lake where the nutrients are purposely enhanced to promote microbe growth. (Waste treatment / Water recycling). It turns out apparently H20, and O2 are not very permeable through ETFE, but CO2 is. So that is interesting. And the ETFE can be modified to reject certain spectrums, such as U.V. I don't know what reject is though, is it does the ETFE reflect the U.V. or absorb it? I prefer that it would absorb it. So going with the notion of ETFE water balloons where the content can freeze to become a "Ice Flow" surface for a lake, and over that a shroud of ETFE film which will hold an air pressure very similar to the outside air pressure, and will retain water vapor, a lake is possible. So those ETFE elements would be preferred to allow U.V. through. I have mentioned the Italian diving bell greenhouses, and also talked about pressurized tubes under 25 feet of water/ice. I will not mutate that and try something else related to it. I have talked about "Batch Bottle" vegetable gardening before, without much acceptance from others. Here I will mention it again. But the bottles will be diving bells / Bottles. A proposed shape would be that of a single honeycomb in a bee hive. The open side at the bottom. The window at the top, the six edges to the sides. A likely maximum size being: with a top to bottom dimension of say 25 to 33 feet (Whatever is sufficient). Smaller ones could be tried first. If using a large size, then a permanent installation. If using smaller, then moveable. So, if you are working with small diving bells / Bottles, you can have a Sub-Fork-Lift bring them down to the bottom of the lake where they can be moved into a diving bell where a human can plant/harvest them. If you are talking about big diving bells / bottles, you will leave them in place like a honeycomb, just under the ice pack. Each will have communion with the lake below with a hole large enough for humans in suits, and their equipment to pass. Should one spring a leak a means of escape will be available by simply swimming down. This should work, unless it would be a "Blow Out" where the whole window exploded. So really, if these things were done, you would only have a few feet of ice and perhaps four layers of ETFE to have the light pass through. » Salt, Water, Power, Crops. OK, if that method is indeed valid, and since you mentioned lakes!!!!! This link is interesting and has to do with U.V. in Antarctic Dry Valley Lakes. Since I am having trouble getting reference materials, I will just describe what I think I know about such lakes, how I think they might work out on Mars, and how this could relate to salt water power. -An ice cover with little or no snow, where some sunlight can penetrate. -A upper layer of less salty and colder water where O2 is concentrated. In fact if you drill a hole in the ice the water will bubble with Oxygen coming out. -A lower layer which is anoxic and warm and very salty. Easily can approach or exceed room temperature. -Small organisms live in the lakes like algae which produce the Oxygen. -This is a natural salt pond solar collector. -I believe that the salt inversion is due to brine that is expelled from freezing winter ice, and also the fresh water that flows to the tops of the lakes seasonally perhaps for about 2 weeks a summer. Creating analog lakes on Mars of this will require intentional manipulations. On Mars we will be able to use both the cold or night and the solar heat of the day to generate both brine concentrates and fresh water. The reservoir will hold cool water with less salt and warm water with more salt. So, energy wise it could be regarded as a giant battery, that you might be able to swim in, may grow vegetables in, and may have habitats in. Stanford researchers have developed a rechargeable battery that uses freshwater and seawater to create electricity. Aided by nanotechnology, the battery employs the difference in salinity between fresh and saltwater to generate a current. A power station might be built wherever a river flows into the ocean. Then the lake can provide energy, 24-7 around the year regardless of dust storms. So for the cold side separation of water into greater and lesser salty components, a radiator may operate surface much of the time, where heat is extracted from the water, and that heat vented to the outside environment. (Turbine optional). Inside the lake you might hope to create a slush which will expel brine. The brine delivered to the bottom of the lake, the slush floating up. And so you recharge the battery. Internal to the lake, you may generate power from salt and or thermal differences. The down side of this is your built materials inside the lake waters must tolerate salt. But that should be a problem which could be overcome. After all diving bells are being used near Italy to grow vegetables. Now as for the lower warm layers of water being anoxic, that is not a requirement. It could be highly Oxygenated instead, and you could have diving gear that can extract Oxygen directly from the water. Therefore you might be on the bottom with just swim trunks, and that breather, and pick up rocks or whatever. Should this be an advantage over normal scuba gear it might be facilitated by charging the lower warmer saltier layers with more Oxygen. Oxygen could be added up to the level where it would "Fizz" out of the water due to lack of sufficient pressure per Henry's law. I do not think that the colder upper water which would be under less pressure could hold enough Oxygen for a diver to breath from it with this apparatus. And this method also requires that the water not turn over. Further I suspect that over time the charged Oxygen on the bottom will migrate upwards through dissolution, and will bubble out to form bubbles under the ice, so this then has to be managed the bubbles suctioned and compressed and returned to the lower layers. As you can see, your lake, particularly it's lower layers can serve as an Oxygen reservoir. Handy to have during the winter, or during a dust storm. But of course this topic primarily is about power from salt differentials. I am interested. Louis also specified Roman Arch methods to build a growth chamber. A article here appears to go into great details about the construction of Roman arch structures I think, on Mars! I would like to use those specifications to discuss a version of lake methods that would deviate from the use of the general use of transparent or translucent ice coverings. GW Johnson has historically had significant things to say along these lines where regolith might be placed on top of ice on an ice covered lake to inhibit the evaporation of the ice, therefore protecting the lake. And it might be briny which I don't mind at all. And then of course there are higher latitude ice and glaciers, which likely exist to a large enough extent to allow for lakes to be created, with deepness of 33 to 600 feet, which from my perspective will be just fine, although I prefer 33 to ~150 feet more or less. Sorry for the imperial units, I am short on time. And now this offers power supplies from salt differentials, and temperature differentials. Power supplies that should be reliable through seasons and dust storms. Stored power, and thermal derived power, and solar power, and really also chemical power, the chemical power will be related to the collection of solar power most likely. Only you would be lighting it up inside with LED's perhaps powered by fuel cells. Or, you might build a Roman Arch on the bottom of a lake and just fill the top of it with air, the rest of it with water. In such greenhouses as that you might grow a variety of aquatic / semi-aquatic plants, including rice and wild rice I presume, and duck weed, which is marginally eatable. As for power sources for this you can try either type of nuclear, or various types of solar. My favorite hope is that with concentrating mirrors, and catalysts, you could split CO2 or H20 or both to generate fuels and Oxidizers. These gases could be conducted to fuel cells under the lake, and the solar collectors could also be a source of heat and fresher water for the lake. The heat conducted to the more salty lower layers to keep them warm, and the fresher water conducted to the colder upper layers to keep them floating above the warmer salty layer. In this case since you would not bring light in through the surface of the lake, you might even have ice 25 feet thick to 33 feet thick, and you could oxygenate all layers of water to the point where a diver could breath by this previously mentioned method. Your water would have sufficient Oxygen for life support (But you will need the apparatus functional), and your greenhouse diving bells and Roman Arch greenhouses will bubbles in them that a human could breath from, and also you could have "Dry Houses" where people could live. Maybe they would be Roman Arch as well, but of course if you fill them completely with air, then you have to make sure they are properly counterweighted against the buoyancy of the air inside. But doing all this you will be able to reduce your work with plastics and concentrate on Bricks, Ice, Water, and perhaps some Metal productions, and still perhaps have a thriving and happy way to live on Mars. Lloyd Godson has today completed his underwater mission and safely returned to the surface. He becomes the first person to live in a underwater habitat with a bioregenerative life support system. Congratulations Lloyd on achieving your dream! BREATHING air provided by algae watered with recycled urine, and pedalling a bike for electricity, an Australian aquanaut emerged today after 13 days living underwater in a "biosub". Lloyd Godson entered the 2m by 3m yellow biosub capsule, submerged in a former quarry on wetlands near the southeastern town of Albury, on April 5. His survival at a depth of 5m hinged on a coil of green algae which provided air in return for Mr Godson urinating on the plants each day. "I will be glad to get out in the sunshine and fresh air again. I have even had thoughts of running like Forrest Gump, and just not stopping!" Mr Godson said before surfacing. Godson, 29, a marine biologist, got funding for the project after winning a "Wildest Adventure" competition run by nature journal Australian Geographic. Mr Godson's partner and support crew member Carolina Sarasiti said he was not trying to break any underwater records. "It's more of an experiment to use a few scientific concepts. He wanted to live his dream, which was to live underwater," she said. A team of divers provided meals to the capsule through a manhole in its base, while some electricity came from the bike and some through a bank of onshore solar cells. A single daily blast of fresh air was also provided from above, after trial and error with levels provided by the algae "biocoil", Ms Sarasiti said. "It's never been done before using air from the plants," she said. A nice post Spacenut. A bit nutty , but actually helpful. I would support using artificial lighting for planets to the limits. That is, if it proves to be more useful to build greenhouses on the surface, then by all means do so. However we have a lot of free research going on here on Earth for the methods to use artificial lighting. I am also aware of RobertDyck's post, and that is a good one as well, where they are growing plants on the space station under artificial lights. 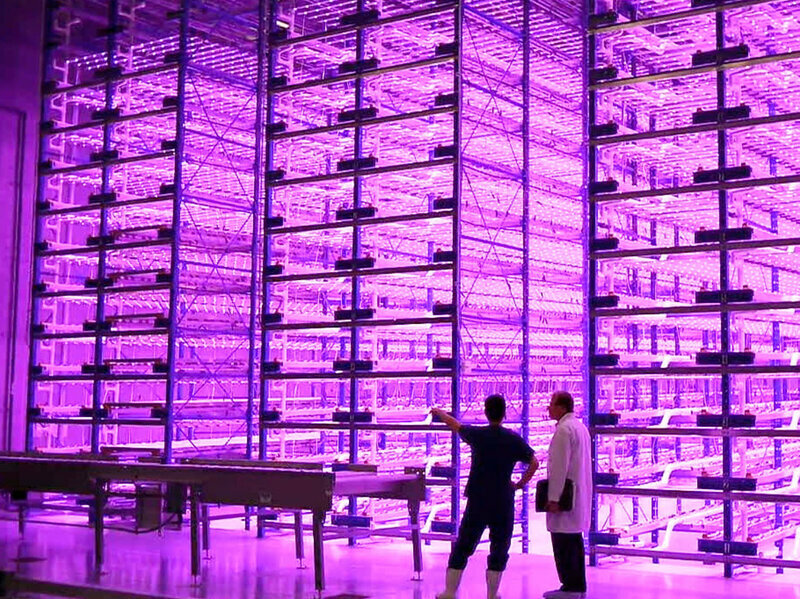 The future of vertical farming, Mitchell thinks, lies not in city skyscrapers, but rather in large warehouses located in the suburbs, where real estate and electricity are cheaper. And oh, yeah, instead of being traditional greenhouses lit by fluorescent lamps, he says these plant factories will probably be "pinkhouses," glowing magenta from the mix of blue and red LEDs. I am not sure that this type of building structure inside a lake is the best bet, but the light sources are something to have. My ideal efficiency for lake agriculture is diving bells with a rather thin air bubble at the top. Perhaps just enough for a human to poke their heads up into from the water to get a breath of air, and enough to shelter your LED/Power supplies. Aquatic plants are a best choice, except they are not very well domesticated. As per previous conversation, standard vegetables can be grown in diving bells. Solar to make chemicals;(Chemicals can be piped into the lake to power fuel cells). A body of ice the size of the north sea converted to a lake could shelter quite a large city. Artificial Light Farming, Solar Energy, and Superconductors are all topics receiving lots of focus and research money. We would have every reason to incorporate those anticipated advancements into a settlement on Mars. -For Artificial Light Farming underwater, the waste heat will be stored in the surrounding waters, and may then be dumped on the surface to generate more power. -Mars has powerful U.V. spectrum in it's light, which goes far beyond that of Earth. It may be that it will be very useful for Solar Thermal, and for Solar Chemical processes. -Mars is colder, so maintaining liquid Nitrogen pipelines for superconductors, should be in many ways more practical. So, this thinking stands Mars on it's head. Instead of trying to avoid the characteristics of Mars that we find hard to cope with using Earth historic Earth methods, we can ask "What could we do to use this characteristic of Mars to our benefit?". Some others have also been doing some of that. The point is a super large city with a high margin of safety for it's inhabitants, and abundant resources, would go a long way towards turning Mars into a platform for the advancement of the whole human race. This is quite different from trying to scratch a living on the surface only, trying to adapt historical Earth methods directly to the surface of Mars. And lets be reminded of Airlocks in such a lake. 90% or more of the pressure differential would be taken care of by just moving up a column of liquid. The rest could be handled by a very lightweight mechanical airlock. Perhaps with clever design, maybe only 10 mb differential pressure handled by a mechanical air lock. An on the surface, if you like you could still have greenhouses, and habs, it would not be forbidden. We have had serveral posts in the past about vertical farming and even had a topic about it as well but it seems to be gone. We have also had others that have posted about farming the under water with fish and other sea creatures as a source for protien as well. Steve Clifford, an expert in Martian hydrology at the Planetary Science Institute in Arizona who was not part of the project, is not ready to count out the role of oceans in forming Mars’s brines. "You need the presence of water to have these brines," he says. Clifford points out that whatever water survives on Mars today—and researchers think there is enough to cover the entire surface with water at least half a kilometer if not a full kilometer deep—requires even more to have existed in earlier times, essentially assuring the Red Planet’s somewhat watery past. A review of things I have previously discussed, but I think worthwhile since the quantity of water spoken of supports the ideas: (In my opinion). So of course one of my pet projects is to use solar energy in a relatively primitive way to warm up water and inject it into an ice covered pool. So it would seem that there is enough where you could fill massive basins with ice covered pools. Likely dust storms would dump dust onto their surfaces and eventually protect them to some extent from evaporation. I guess I will talk about flooding large basins with ice covered pools again as a method of terraforming. The object would be to simulate the potential of chemical driven ecosystems such as may occur under ice sheets in Antarctica, and possibly in locations under Martian ice caps, perhaps Jupiter's moon Europa, and perhaps Enceladus, a moon of Saturn. Chemosynthesis might be possible with microbes, with the chemicals that appear to be in the Martian subsurface, and with chemicals humans and their machines might generate on Mars. The process might involve injection of gathered solar heat into the waters, most likely solar concentrators used. If the Boring Company would branch out to Mars, it would also be possible to build industrial complexes in tunnels under the bodies of water. The waste heat from these industrial processes could be quenched into these waters. So in this case the heat most likely would come from electricity from either solar panels, or turbine generators powered by concentrated solar flux. In particular I have my eyes on the Northern Hemisphere, as it would accommodate an extensive body of water perhaps ~100 feet deep? ~100 feet deep is a magical number for Mars, as it would provide ~1 bar of pressure on average on the "Seafloor" of this created sea or ocean. Where to place solar installations? Well, perhaps up on the ice, to help shade the ice and protect it from evaporation. A coating of regolith (Credits to GW) might also be used, mixed with a puffy substance such as styrofoam. Or maybe a sheet of Mineral wool tar paper, with a reflective coating, and maybe a couple of inches of dirt over that. The point is to protect the ice, but not make it warp to failure from the weight of the protectant. So solar panels over that, and yes heliostat gang type tower power plants. Now if you want photo life, you now have LED's that are efficient. You can put gardens in the Boring Company tunnels in some cases, and you can also illuminate your created Lake/Sea/Ocean. And although the LED's are efficient, the heat they do generate serves to warm the waters, and to grow photo life. Such photo life can be microbes, or macrobes. (Ha Ha may have created a word). By that I indicate seaweeds and also vascular land plants. Seaweeds and Vascular Plant could be inside of special enclosures within. Low hanging fruit would be flat top enclosures with just a bit of an air pocket, say 1, 2, or 3 feet deep. That roof would need to be weighted down with stones or dirt to keep it from deforming, and to keep the enclosure from floating up. The temperature of the water inside however could be quite friendly to humans. LEDs would be on the ceiling. For multicellular Algae, salinity would need to be controlled. For Duck weed, fresh water needed. Other plants/crops of a vascular and terrestrial nature could be put into floating planters, or perhaps there would be a floor. But if you had a floor, then your air column would be greater and you would have to take greater measures to weigh down the ceiling and to keep the whole structure rooted to the floor of the body of water. Or you could do this, one of my favorites. However you would use LEDs not sunlight. You may note that one result of these devices is fresh water, which might not be a bad thing to have on Mars. The older members here may be tired of this, but there are some new members. *Yes I think you could have a 20,000 leagues under the sea environment suits to walk about on the bottoms of these waters. No explosive decompression to fear, unless you don't weight yourself down.